Ruth trained at Bristol Old Vic Theatre School and has spent the past thirty years working in Stage Management and Lighting. Ruth joined Bristol Old Vic Theatre School in her current role of Stage Management Tutor in 2017. 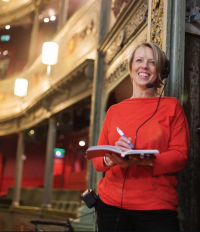 Throughout her career Ruth has worked and toured with numerous venues and companies as a Stage Manager and Re-lighter including: Wolsey Theatre Ipswich, Derby Playhouse, Brewhouse Theatre Taunton, M6 Theatre Company, Northcott Theatre Exeter, Bristol Old Vic. Ruth was also the Lighting Designer for Keswick’s Theatre By The Lake before joining BOVTS as a Visiting Specialist in 1995. She continued her freelance work and was a regular at Bristol Old Vic, Theatre Royal Bath and was Lighting Designer for the inaugural season of plays at the then newly established Tobacco Factory Theatre in 1998. Before becoming a full-time member of BOVTS staff as Technical Manager. Ruth also designed and delivered many short courses for Bristol University, UWE and Theatre Royal Bath’s Education Department. In 1999 having assisted in the creation of the new 3-yr Professional Stage Management BA for BOVTS and following the School’s acquisition of Christchurch Studios, Ruth developed the Film and Television strand for the Stage Management Course becoming Head of Film & TV Production in 2001. In 2007 Ruth left BOVTS to take an international research trip and returned to freelance production roles in theatre, events, film and corporate work. Highlights during this time include: Event Manager for BBC’s Antiques Roadshow, Showcaller for Skyfest 3 years running, Script Supervisor for Ragdoll’s In The Night Garden, and Stage Manager for Bristol Old Vic’s Coram Boy at Colston Hall. After five years Ruth joined Bristol Old Vic as Company Stage Manager and saw in shows such as Sally Cookson’s Peter Pan and Jane Eyre, Richard Eyre’s Long Day’s Journey Into Night starring Leslie Manville and Jeremy Irons, George Mann’s Pink Mist, and Tom Morris’ Internationally acclaimed A Midsummer Night’s Dream and his new musical The Grinning Man.